I have shared my love of Joovy before and that love just keeps growing. I recently reviewed the Joovy Caboose Too Ultralight and still love it. In fact is has become my permanent stroller in the car. But today I wanted to tell you about our newest Joovy addition. It is called the Joovy Spoon. 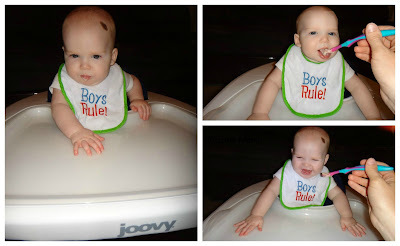 The Joovy Spoon walker is essentially two great products in one. It is a walker and a highchair. For meals and snacks the Spoon has a large tray with a removable insert that is easily cleaned and even dishwasher safe. The oversize tray is great for holding your child's favorite toys as they play. The tray is a bight white with a high gloss finish which gives an elegant look and blends beautifully in any decor. 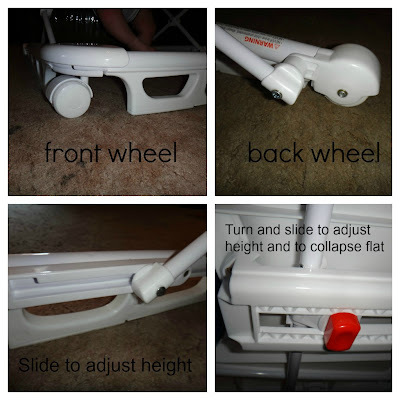 The extra large base provides stability for when baby is learning to walk and becomes mobile and begins to walk around with it. The tray is wide enough that baby fingers won't get pinched when bumping into the walls. The seat is comfortable and provides plenty of support. The back of the seat has a padded high soft cushion. The seat is machine washable and features a beautiful dark blueberry color (also comes in Charcoal, green, and purple). 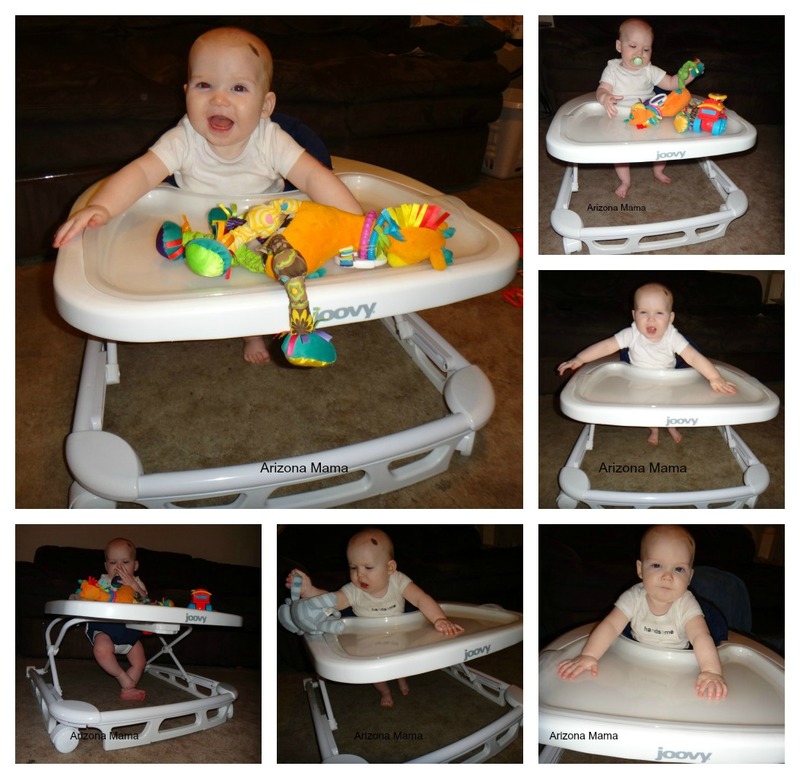 There are three height positions that are perfect for baby up to 30 lbs and/or 33.5 inches tall. The Spoon is built with steel reinforcement and oversized wheels. It even has non-slip stair pads and meets (or exceeds) all the government standards in compliance and stair safety. Of course Joovy recommends keeping stairs out of reach by using a gate. We don't have stairs in our home so that is one less thing for us to worry about. When I received the Spoon I took it out of the box and was happy to see that it was mostly put together already. I just needed to add the front wheels and the seat pad. The Spoon is completely BPA, PVC and Phthalate Free. It folds flat to make travel and storage easy. I was too excited to open the box and put Evan right in when it came. Evan loved just banging on the tray at first. When I gave him his toys he really liked that he had room to bag them around and play. With his exersaucer there really is little to no room for additional toys besides those attached and usually wants out right after only a few minutes. With the Spoon Evan was happy to stay in longer. I fed Evan his first bites of food in the Spoon. It was perfect for him to be supported upright for eating. I loved the height as I could sit on the floor and feed him and he felt stable by touching the floor with his feet. After eating I could easily remove the tray and wash it. I really like that I can lift the tray and clean it thoroughly and yet the base tray is still there for him to play on. Plus the tray cleans up so easily and looks like new again. The seat is also easy to remove and wash. After eating Evan can play with his toys and bang around on the tray (one of his favorite activities). So far Evan has been able to move the Spoon backwards a little on the carpet. On the tile he moves it backwards really well and a little forward. I know it won't be long and he will be all over the place. I really like the way it folds easily so we can take it anywhere with us or store it away. Thank you to Joovy for sponsoring this review. Looks great! Love the large tray and the versatility! I love the tray cover, those are so much easier to clean! I am in love with the fact that this folds down and can be easily stored! I love that it doubles as a high chair... That tray is awesome!! Love the color options too. What a great product to have for baby!! I like how well it collapses! Looks simple. Great big tray! Love that you can wash the tray in the dishwasher!